The Rev. 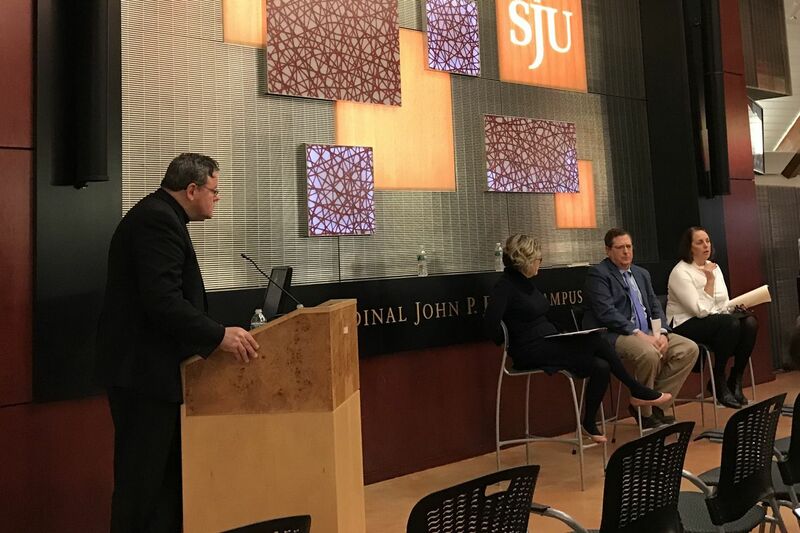 Dan Joyce, left, of St. Joseph's University, moderates a panel discussion about the Pennsylvania grand jury report into clergy abuse on Wednesday, February 6, 2019. Also present were (L to R) Kathleen Sparrows Cummings of Notre Dame University, Philadelphia attorney Henry Hockheimer, and Main Line trauma therapist Cara Tripodi. On a Jesuit campus in Lower Merion Township, inside a building named for a Delaware County man who would one day become a cardinal of the Roman Catholic church, the answers to clergy sexual abuse seemed, at least to those typically in church pews, perfectly clear. Force dirty bishops and priests to resign or fire them. Let women become priests. Let priests marry. Let married men and women become priests. Make sure that American leaders of the church return from this month’s Vatican meeting on clergy abuse with substantive orders to fix the rotting architecture of a religious institution that millions of Pennsylvanians turn to for sacred guidance. These ideas - more like commonsense declarations, really - came out during a Faith-Justice Institute panel on the Pennsylvania grand jury report into clergy abuse. They were discussed by lawyers, academics, ordinary citizens, and a Jesuit priest who presided over the discussion. And yet, even as the pope himself just a few days ago acknowledged sexual abuse of nuns by priests in addition to decades of documented rapes of children worldwide, it is the worshipers who stand alone in possessing a moral clarity and urgency that their bishops so acutely lack. Another “historic” clergy abuse meeting is set for Feb. 21-24 in Rome. It will be the supposedly “historic” meeting that U.S. bishops punted their own supposedly “historic” planned reforms to during their own “historic” clergy abuse meeting in Baltimore late last year. Expectations are that this month’s big meeting may amount to yet more spectacle over substance, even as the flock is, plainly, fed up. A crowd listens attentively to criticism and discussion of the U.S. Catholic Church and the clergy abuse of minors during a panel discussion at St. Joseph's University in Philadelphia on Wednesday, Feb. 6, 2019. Gallagher earned a loud ovation from the 60 or so who, like him, had come from as far away as Allentown to hear a three-person panel discuss this sordid crisis from a room inside the Cardinal John P. Foley Campus Center on City Line Avenue. “I worry as a parishioner of St. Margaret’s of Narberth where the pews are not as full as when I moved there in 2001,” said a far more subdued Henry Hockeimer Jr., the highly regarded white collar defense attorney from Philadelphia who was among the panelists. Also deeply pained was panelist Kathleen Sprows Cummings, a Notre Dame University historian of the church by way of Aston, Pa., where she was raised Catholic. For years, the noted church scholar said, she had been satisfied with working from within the institution for reforms over the long haul. Not anymore. As she wrote in a New York Times op-ed last year, Cummings now wants immediate and total change. And yet, despite intensifying disgust that she said is shared by thousands of other people, she expects little real action from the top. Cara Tripodi described her own discomfort as a sense of “resignation.” As a Catholic and a Wynnewood therapist who specializes in sexual trauma, the panelist had a difficult reaction to the Pennsylvania grand jury report into diocesan clergy abuse at six of its eight dioceses. She could not get past what leaders of the church had done to enable or bury criminal behavior against children. It is a well-worn maneuver for cowardly or inept leaders to cover up their own failings with a whitewash of endless meetings and committees. And yet, this is what we have seen in the behavior of bishops and Vatican officials since the Pennsylvania report shocked the world. It is morally objectionable, though, when such clever cowardice serves to shield religious men from accountability, wounded children from justice, and well-meaning worshipers from a true beacon to moral life on this earth.